Seven NYC young adults share their stories of immigration and finding themselves. Molly Grogan reviews. The New York City seen through the eyes of the seven performers of Undesirable Elements: Generation NYZ at first sounds a lot like what you would expect from young adults who grew up here. This great city, whose name they shout out frequently and proudly, like a slogan or a stadium chant, is the city of their teenage years, of “Subways, Prospect Park, Bookstores, Bodegas and Pizza.” But because many of these New Yorkers are from immigrant families, when they also tell us the city represents “Diversity, Acceptance, Culture and Opportunity,” we know these aren’t abstractions in a political argument, but realities they have experienced first-hand. In the same way they have known “Cops, Gentrification, Homelessness and Inequality,” they also tell us, as kids raised by foster families and abusive and neglectful parents, or just parents who fled violence in Mexico or Puerto Rico and settled wherever there was work or affordable housing. In this way, Monica, Mohammad, Edwin, Rafael, De-Andra, Syl and Porsche sum up their lives as seasoned New Yorkers, and the oldest among them is only 22 years old. Undesirable Elements is a 25-year running, interview-based documentary theater project interested in “outsiders within their mainstream communities,” created by the director Ping Chong. With over 50 productions to date, the series has given voice to people with disabilities and claiming diverse cultures and sexual orientations, through a process of intensive story gathering, resulting in shows created to tell stories of personal resilience against a larger political and social chronology. Its most recent NYC iteration is a commission by the New Victory Theater, and the production’s participants were selected from a call that went out to schools across the five boroughs. The inclusion/exclusion question – who’s “in” and who’s “out” – is the defining issue of adolescence and it figures large in these young people’s stories, but the reason and context of their lives in NYC, clearly defined by Ping Chong and his collaborators Sara Zatz and Kirya Traber, is the history of immigration to the US in the last fifty years. The parameters are staked out early in the performance: the Great Migration of 6 million African Americans from the rural southern United States to its cities in the north, between 1916 and 1970, and the 1965 Immigration and Nationality Act, signed into law by President Lyndon B. Johnson, to eliminate national-origin quotas that privileged immigration from Northern and Western Europe. The first event brought Porsche’s grandfather to settle in New York City from his native Tennessee; the second made it possible for Mohammed’s parents in Pakistan and Syl’s mother fleeing war-torn Yugoslavia to get visas to the US. It seems like an incredible coincidence or a dumb stroke of luck that this show opened the weekend in which we celebrate the victories of the Civil Rights struggle led by Dr. Martin Luther King, Jr. and the one in which we discovered President Trump’s “shithole” comments and his apparent desire to return to those pre-1965 quotas. The seven students of Generation NYZ, who sit in a semi-circle across the stage with their scripts on stands before them, all tell stories about finding themselves, but mostly about immigration and growing up in the face of great struggles that caused them to mature faster than most kids should: bilingual Syl was translating important papers for his parents at age 5, Edwin, named after his “deadbeat dad,” was fighting kids at his Lower East Side school regularly at the age of 8, Rafael could never play outside because of crime in his San Juan neighborhood, Monica was taunted as a “dirty Mexican” by her Brooklyn classmates… Negative (as in reverse color) images of city street scenes are projected behind them, and their stories paint a similarly inverted picture of what childhood should be, involving homelessness, drug abuse, imprisonment, separation, poverty, depression, neglect… For some of them, adolescence also meant navigating coming out as gay or gender nonconforming or weighing the constraints of religious beliefs and family tradition against personal freedom. They introduce themselves to us in a variety of languages, but they all share the experience of being an outsider until, finally, something clicked for them: a new neighborhood, a concerned teacher, music lessons, a part in a school play, a job, friends who understood what they were going through. Generation NYZ is described by Ping Chong as a “chamber piece of storytelling,” but this small ensemble doesn’t play individual pieces of their music so much as toss them around the semi-circle like a hacky sack, often telling each other’s stories, as if sharing a heavy load. To mark a progression to the next story, they clap in unison, once or in quick succession, and it feels like they are punctuating small victories, realizations, new moves. If they represent a generation as the title indicates, they show us the best of an America that knows the value of democracy and freedom and that will support each other no matter the obstacles. Monica, who has DACA status (now threatened) but still claims she has “hope” can give us hope, too. 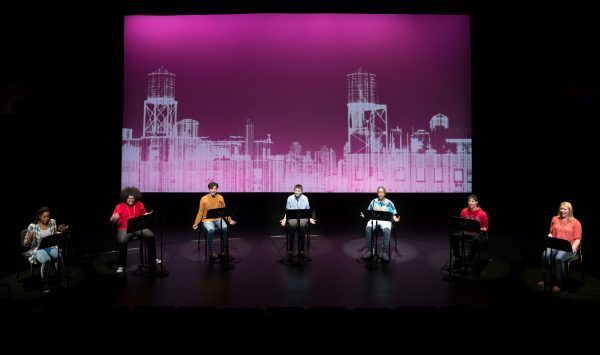 I couldn’t help noticing many parallels between Generation NYZ and Motus Theater’s Panorama, currently running at La MaMa: both tell a similar overarching story of immigration and finding belonging, often through art, in New York City, using shared narration. In Panorama, we meet a community of NYC artists from around the world; in Generation NYZ, those artists are still dependent on the cultures and identities given them by their parents but they are on that journey of finding themselves, something they, like their older counterparts in Panorama, know with conviction they could only do in a city as diverse as New York. For a short time, you can put the whole story together by watching both shows in succession. Having done just that, I can guarantee you a fascinating experience, not to mention a potent tonic to racism, ignorance, cowardice and mendacity. “In these difficult and unjust times, we need art and the power of storytelling more than ever,” Ping Chong writes in the program. In the absence of much political resistance on NYC stages, these shows point one effective way forward. Undesirable Elements: Generation NYZ runs to January 21, 2018. More production info can be found here.